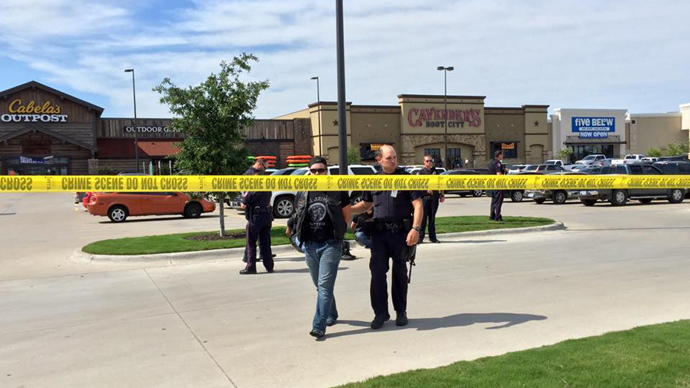 At least nine people have been killed and 18 injured in a shootout between rival biker gangs outside the Twin Peaks Restaurant in Waco, Texas. The brawl quickly escalated from fists to gunfire despite police, aware of possible trouble, being at the scene. Eight bikers have been killed as a result of the violence that broke out between the rival gangs in Waco, while one more died in hospital, local media reported citing police. At least 18 more people suffered gunshot and stab wounds and were brought to a local hospital. Police said no officers were wounded or killed in the shootout, but it was unclear whether any bystanders were injured. According to witnesses, members of two or even three rival biker gangs were having a brawl in and outside the Twin Peaks Restaurant when the gunfire erupted. Witnesses said the fighting began with punching and kicking but quickly escalated and knives, chains and bats could be seen before the shooting started.Waco police officers were already at the scene when the action escalated, Waco Police Sgt. W. Patrick Swanton said, according to KWTX-TV. “Gang members were shooting at each other and officers at the scene fired their weapons, as well,” Swanton said, confirming no policemen were injured. Police have reportedly been arresting anyone bearing arms at the scene, recovering chains, knives, bats, clubs and firearms. The FBI has reportedly arrived at the scene. Police have warned that the entire Central Texas Marketplace is closed, urging people to leave now and avoid this area. Police had been anticipating trouble when bikers started gathering outside Twin Peaks, with District Attorney Abel Reyna warning of potential dangers from rival gangs for months. Reyna told KWTX that a dispute which had erupted between two local motorcycle gangs spilled over to involve the Dallas-Fort Worth area gangs.